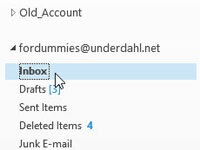 Click the Mail button in the Navigation bar (or press Ctrl+Shift+I). 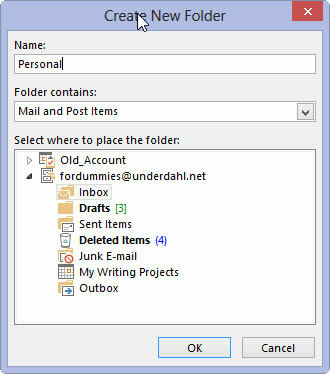 Select the word Inbox in the Folder list. Select the Folder tab and click the New Folder button in the Ribbon. The Create New Folder dialog box appears. In the Name text box, type a name for your new folder, such as Personal. You can name the folder anything you like. You can also create many folders for saving and sorting your incoming e-mail. Leaving all your mail in your Inbox gets confusing. On the other hand, if you create too many folders, you may be just as confused as if you had only one. Your new folder appears in the Folder list. You now have a new folder named whatever you entered.